Since they were founded in 1892, the Liverpool Football Club name was synonymous with fame and glory. Both domestically and internationally, Liverpool is the most successful British club of all time; they have won 18 League titles, 8 League Cups, 7 FA Cups, 5 European Cups and 3 UEFA Cups. They are one of the most popular football teams in the world, with over 200 supporter clubs in at least 50 different countries. And yet, their magnificent history will forever be plagued by two of the worst stadium disasters of all time: Heysel and Hillsborough. Liverpool team picture from the club's first season. Following the moving of Everton to Goodison Park in 1892, the club's then-president John Houlding suddenly found himself with the rights to Anfield stadium and no team to play on it. Always a practical man, Houlding quickly decided to circumvent this problem by forming his own club – Liverpool (should not be confused Liverpool Ramblers AFC that was founded ten years earlier). After becoming a member of the Football League in 1893, the team managed to get promoted to first division after one season in the second division. Early on, Liverpool established themselves as one of England's top clubs, winning League titles in 1901, 1906, 1922 and 1923. Though an immensely popular club even then, Liverpool FC were not particularly consistent in the post-WWII period. After claiming their fourth League title in 1947, the club entered a period of mediocrity which culminated with their relegation to Second Division in 1954. Things took a turn for the better after Bill Shankly was hired as manager, however; Shankly's first order of business was to release the entire first team squad. He then turned the club's storage room into the famous "Boot Room", a place that would serve as the coaches' secret meeting place for the next three decades. Shankly's unorthodox methods bore fruit soon enough. After making their way back to the First Division in 1962, Liverpool won the League two years later. During the reminder of Shankly's tenure as manager, they claimed an additional two League titles (1966, 1973), two FA Cups (1965, 1974), as well as their first European trophy – the 1973 UEFA Cup. In 1974, Shankly resigned from his job due to a need for a break, leaving the club in the hands of his assistant, Bob Paisley. The change of personnel did not do much to stop Liverpool's dominance. Under Paisley, Liverpool were a remarkably consistent team; during his nine years in charge, the club won an incredible six League titles and three League Cups. Their reign spread over Europe as well, with Liverpool winning one UEFA Cup and three European Cups in the period between 1976 and 1981. After Paisley's retirement in 1983, his assistant Joe Fagan continued the successful tradition by leading the team to a Treble in his first season in charge. In 1985, Liverpool faced Juventus in the European Cup final. Unfortunately, that match is now widely known as the scene of the Heysel disaster; after some unruly fans caused a perimeter wall to collapse, 39 fans were crushed to death. In the aftermath, considering the blame for the accident was placed solely on Liverpool fans, all English clubs were banned from European competitions for the next five years. In the absence of European games, Liverpool started focusing on the domestic competitions. But after winning two more League titles in 1986 and 1988 and an FA Cup in 1985, tragedy struck again. In the 1989 FA Cup semi-final between Liverpool and Nottingham Forest, 94 fans died in a crowd crush only six minutes after the game had started. To this day, the Hillsborough disaster remains the worst stadium disaster in English football. After claiming their ninth League title in 1990, Liverpool entered a downward spiral. With only a couple of Cup trophies and some mediocre league finishes in the 90s and early 00s, it seemed like Liverpool's star had waned. Nevertheless, they proved their mettle in the most exhilarating way possible; after reaching the Champions League final in 2005, they recovered from 3-0 down at half-time to eventually beat Milan on penalties. As it turned out, this extraordinary victory was the club's swan song. During the next decade, Liverpool were mostly seen playing second fiddle to other English clubs, with only two Cup trophies and a second-place league finish to show for their efforts. The most characteristic part of the logo is the drawing of the mythical “Liver Bird”, which is the symbol of the City of Liverpool. The same creature could also be seen as a decoration on Royal Liver Building in Liverpool. 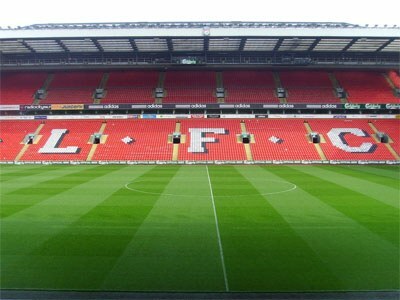 In the upper part of the logo the well-known Liverpool FC saying "You'll never walk alone" is printed. 1893 Member of the Football League. 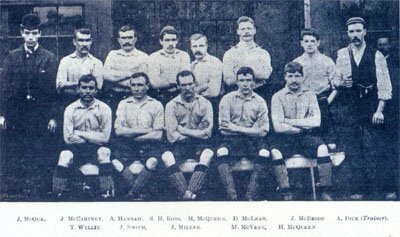 1894 First season in Division 1. 1901 Winning Division 1 for the first time. 1959 Bill Shankly is appointed as manager. 1965 Winning their first FA Cup. 1973 First UEFA Cup trophy. 1977 First European Cup title. 1981 First League Cup title. 1981 Winning their first British Double (the League and the League Cup). 1984 Ian Rush score 47 goals during the 1983–84 season and breaking the club record. 1984 Winning their first Treble (League, League Cup and European Cup). 2005 First Champions League title. 2018 Philippe Coutinho is sold to Barcelona for £142 million, a new club transfer record.